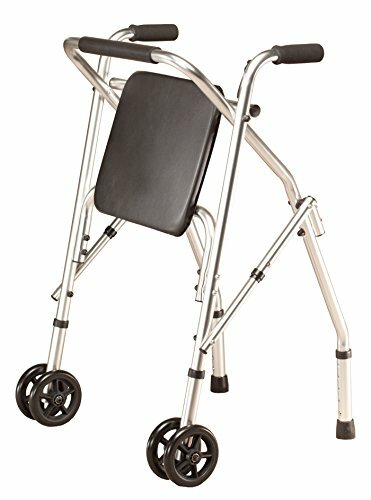 Walker with seat combines stability to help you stay on the move with a seat and back rest for relaxing breaks. Ideal for casual daily use and outdoor walking, the 5"dia. front wheels maneuver smoothly while rear tips double as brakes. Lightweight, powder-coated frame folds in seconds for easy transport. Rolling walker with seat is available in 3 colors: blue, red and silver. Overall: 22"W x 20"D; folds to 10 1/2"D. Overall height adjusts 33" - 37". Walker with wheels and seat measures 18 1/2" between handles Seat measures 13"W x 12"L. Seat-to-ground height: 22 1/2" - 26 1/2". Supports up to 300 lbs. Weighs 8.36 lbs. Height adjusts 33" - 37"
Seat-to-ground height measures 22 1/2" - 26 1/2"